The Church of St. Andrew Bobola, Shepherd’s Bush, is one of London’s hidden gems. St. Andrew Bobola was a Polish Jesuit missionary and martyr, known as the Apostle of Lithuania, and this Roman Catholic Church dedicated to him opened in 1961 in a former Presbyterian Church building that has been extensively restored as a living memorial to Poles who died during World War II. The church holds the main shrine in Britain to the dead of Katyn, the 1940 massacre of thousands of Polish officers by the Soviet secret police. Given his extensive involvement with the church, it is no surprise to find that he was appointed its custodian. The skillfully integrated stained glass windows throughout the church relate to the Polish soldiers, sailors, and airmen who fought alongside the Allies in World War II. Their most distinguished leader was General Wladyslaw Anders, whose memorial fills the triple lancet stained glass window in the south transept. General Anders led the Polish Second Corps in the final push against German troops in Italy, including the heroic assault on Monte Cassino. The window depicts the crucifixion and includes the most revered Polish military decoration, the Virtuti Militari Cross. The second remarkable window – in the north transept [pictured below] – commemorates Polish airmen who fought in the Battle of Britain. This was designed by the painter Janina Baranowska, who won the competition set by the Union of Polish Airmen in 1979. . . . The window was made by the firm of Goddard & Gibbs and inaugurated by Cardinal Rubin on 3 April 1980. The three lancet windows cleverly integrate the Cross with two swooping plane trails. 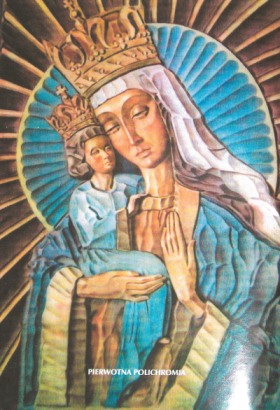 The composition is surmounted by the icon of Our Lady of Ostrobrama. Janina Baranowska—one of the church’s stained glass artists—was born in Grodno (in modern-day Belarus) and remained there until the outbreak of the Second World War. In 1940 she was arrested and deported to Russia. Two years later she was released and joined the Polish Army in its march to the Middle East. In 1946 she moved to London, where she studied under Professor David Bomberg at the Borough Polytechnic from 1947 to 1950. For a number of years she was on the boards of the National Society of Painters, Sculptors & Printmakers and the Association of International Arts. In 1980 she became president of the Polish Artists Society in Great Britain (now the Association of Polish Artists in Great Britain) and a member of the Catholic and Christian Artists group. Many Polish artists were forced to flee mainland Europe during the World War II. Some of these artists journeyed through many countries before settling in the UK, while others were captured and imprisoned before finding their way to British shores. In addition to organizations like the POSK and APA, St. Andrew Bobola’s has been a key source of support for many in the Polish émigré community. Monsignor BronisÅ‚aw Gostomski was a recent parish priest at the church who was known for working hard to support the Polish community. He spearheaded a £1 million renovation project at the church and worked to unite older and younger generations of Poles within his congregation. As chaplain of the Polish Ex-Servicemen’s Association (SPK), he cared spiritually for those who had been left in England when the dramatic events of World War II and the Cold War took their course. He also cared for those who had come to England in more recent years in pursuit of a new life and opportunities. Tragically, he was among the 96 victims of the Polish Air Force Tu-154M plane crash on April 10, 2010, which also claimed the lives of Polish president Lech KaczyÅ„ski, Polish president-in-exile Ryszard Kaczorowski, and many of the country’s other top officials and dignitaries. With these connections St. Andrew Bobola’s commemorates not only the Poles who died during World War II, but also those who have contributed to Polish life and culture in the UK. 3. Douglas Hall, Art in Exile: Polish Painters in Post-War Britain (Bristol, UK: Sansom & Company, 2008). 4. Pole Position: Polish Art in Britain 1939–1989 (Sheffield, UK: Graves Gallery, 2014).